Besides the Verdigris version of Cymon Clops, Doktor A also brings a red painted edition of only 10 pieces. Cymon Clops is a 4″ (around 10 cm) tall resin figure and at $100 (£88) this is definitely a must have for any Doktor A collector. Personally I’d love to add it to my collection. The little guy has an inset glass eye and real cast metal winding key. How cool is that?! He opted for a single eye of superior magnification rather than two eyes of a lower standard. A small number will be available on preview night. 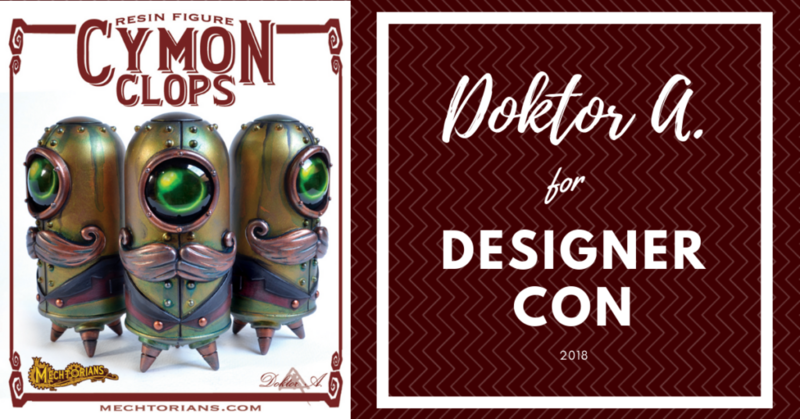 Doktor A can be found at booth 300. You can find Doktor A on Facebook, Instagram, Twitter and Patreon.